European officials are working on a system whereby "trusted companies" can self-declare exports to the North from April 12. Although senior sources in Brussels have warned it will be impossible to continue this indefinitely unless a deal, similar to the backstop, is agreed. "Every effort to keep controls away from the Border will be made. "We are looking at having checks at point of manufacture, or processing in the case of food, and using 'trusted trader schemes' to reduce disruption to trade and the flow of goods," an EU official said. While no-deal plans published by the EU yesterday said it would "immediately apply its rules and tariffs at its borders", a well-placed source said that even in a worst case scenario "no real EU action will happen on the Irish Border for several months". But a source said: "The Irish border risks quickly becoming 'a smugglers' paradise' which would prompt calls for controls from many sides." "If there is no Stormont government, if powers are needed and ministerial direction is needed which is not available to civil servants currently, it would require some direct application of powers here from Westminster," she said. He admitted that if Mrs May can't get her Brexit deal through the House of Commons then achieving the objective of an open border "becomes more difficult". "We are in ongoing discussions with the European Commission to ensure the manner in which any new regime would be applied does not give rise to the need for a hard border," his spokesman said. The DUP has latched onto the Taoiseach's repeated insistence there are no plans for a hard border. Their Brexit spokesman Sammy Wilson said it was evidence the Withdrawal Agreement is "based on a foundation of sand" as there will be "no checks along the Irish Border, therefore no threat to peace in Northern Ireland". He asked Mrs May: "When are you going to stop using Northern Ireland as an excuse, and do you realise that the importance of this agreement to delivering Brexit, and also to the union of the United Kingdom, is such that we will not be used in a scare tactic to push this through?" 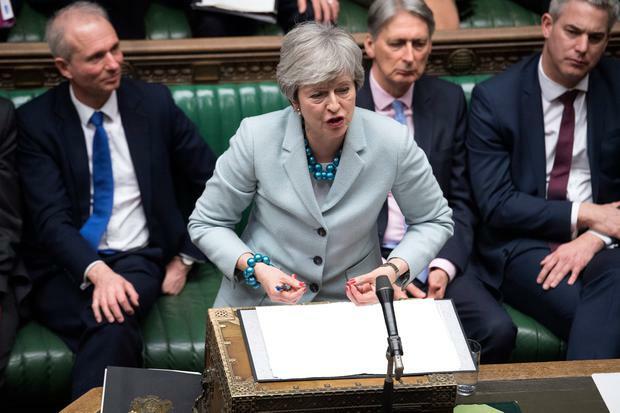 In response, she told the House of Commons: "What I have genuinely being trying to achieve through everything that I have been doing is ensuring we respect the wishes of the people of Northern Ireland and we respect Northern Ireland's position within the United Kingdom. "It is the case that these remarks about the Border have been made by, I think I'm right in saying, the Taoiseach and others previously, and then have been contradicted in turn by the European Commission." Fianna Fáil's Lisa Chambers also called on Mr Varadkar to be "more transparent with the public about the Government's plans" if a disorderly Brexit does occur. "It is clear that discussions are being had but when questioned on this issue the Government continue to trot out vague and ambiguous statements that shed no light on this matter. Mr Lane is to say: "While a no-deal Brexit would constitute a severe economic and financial blow, our work to improve resilience over the last decade means that the shock should not be amplified by fragility in the financial system."